Cornbread Suppers: Cornbread Supper, March 1, 2010 - Many Soups! This week, Cornbread Supper at 6:00 PM followed a 4:00 PM Jamie Oliver pass it on session dedicated to teaching three people to cook Chicken Fajitas the Jamie way. Each of the three will then teach three more people to cook the recipe. 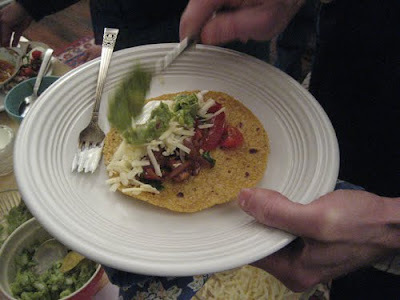 Your documentarian shared her second test run of the chicken fajita recipe at Cornbread Supper. Jamie's recipe includes a flavorful base of quick-marinated/quick-cooked chicken with onions, peppers, and spices, topped with a quick-chopped fresh salsa and some add-ons (guacamole, cheddar, sour cream) all wrapped in a tortilla. Flavor upon flavor upon brilliant flavor. All in 19 minutes...maybe eventually, but it's definitely in the range of quick weeknight WONDERFUL food. The recipe is in Jamie's Food Revolution, and as he hasn't posted it yet online, we won't either. While the book is awesome, the project it supports -- teaching friends to cook specific recipes so they can then teach friends to cook the recipes and "cook it forward" -- that's greater than awesome. Because the cooking project had the kitchen in a bit of a British tizzy, instead of making the usual Kentucky black skillet cornbread and other cornbread-y things, we made a large pot of vegetable-beef-bison soup. Also very much a timeless Kentucky meal, this dish cooked out of the way in a large slow cooker while the stove got sizzling with aromatic chicken/onion/pepper/spice mixtures.